deep-fried fish covered with sweet bean paste sauce, garlic, and ginger). Dishes are prepared without MSG. Pacific House Museum Custom House Plaza/Scott St. F-Sun 10-4. $3 (includes Custom House). 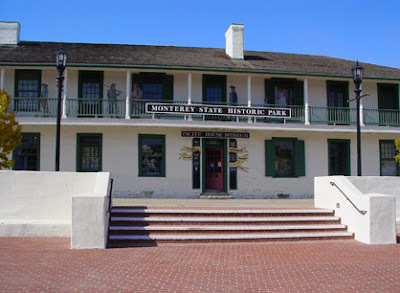 This two-story 1847 adobe houses the Monterey Museum of the American Indian. A unique original feature was a water well enclosed inside (instead of outside) the south end of the building. A beautiful walled Memory Garden is the setting each June for the annual Merienda celebrating Monterey's birthday. Desco 499 9th St./Washington St., (510) 663-9000. L-D M-Sat, D daily; $$-$$$. The Latin word “desco” translates as “dinner table,” and this welcoming northern Italian restaurant is indeed a great spot to enjoy a meal. Situated inside a vintage 1876 building--with original brick work, mosaic-tile flooring, and enormous windows--it is a feast for the eyes as well. Outside on this traffic-quiet street crammed with vibrant restaurants, trees strung with tiny lights bring cheer to the night. For a starter, don’t miss the seasonal bruschette trio (ours included pesto, pureed mushrooms, and prosciutto with caramelized onion toppings). A green salad composed of blood orange chunks, pistachios, and swirls of fennel was tasty and refreshing, and followed by a brown bag full of housemade Italian bread that was perfectly crusty on the outside and soft and stretchy on the inside (the bag keeps it warm). Most of the pastas are made in-house, and the pappardelle with lamb cheek-red onion sugo braised in Sangiovese was especially delicious accompanied with a San Vicenti Chianti Classico Toscana (all wines are from Italy, and classic cocktails area also available). Pizza choices include both round traditional and rectangular stretched. We opted for a traditional thin-crust roundtopped with mozzarella, broccoli rabbe, and a delicate housemade sausage but no red sauce. Our waiter offered a plate of bright red Calabria chiles from the toe of the boot of Italy to spice things up, and a spicy, full-bodied, Zinfandel-like Tommaso Bussola Valpolicella Veneto went especially well with it. Main courses of steak, pan-roasted chicken, and more are available, but we moved on to a nutty apricot-almond torte for dessert. I couldn’t resist trying the traditional Italian after-dinner drinks--a black fernet branca made with menthol, herbs, and spices was medicinal; a sweeter cynar didn’t taste like the artichokes it is made with. In addition to table seating, options include booths, at the central bar, at a communal table, and outside by the sidewalk. di Rosa 5200 Sonoma Hwy. (Hwy. 121)/near Duhig Rd., 6 mi. SW of town, (707) 226-5991. W-Sun 10-6; Nov-Mar 10-4. Gallery: $5 donation; tours: $9-$15, reservations required; under 12 free. No pets. The show at this expansive 217-acre contemporary art museum and sculpture park begins in the parking lot, where wrought-iron sheep greet visitors. This is one of the largest regional art collections in the country, and tours last 1 to 2½ hours. So extensive is the collection of more than 2,000 pieces by Northern California artists that a tram is used to shuttle guests from the Gatehouse Gallery to the Main Gallery, located in a converted tractor barn. Visitors then walk past the Sculpture Meadow to a 19th-century stone winery building that was converted into a house and now into a gallery. The property is also a nature preserve and is a stopping point for migratory birds. It features towering oaks, a 100-year-old olive orchard, a 35-acre lake, and its own vocal flock of peacocks. Viansa Winery 25200 Arnold Dr. (Hwy. 121), 5 mi. S of plaza, (800) 995-4740, (707) 935-4700. Tasting daily 10-5; tour daily at 1, 2, 3. Built on top of a hill commanding magnificent views of the area, this winery is named for its original owners--Sam Sebastiani and his wife Vicki (the name comes from merging the first two letters of each of their first names). The beautifully crafted Tuscan-style winery building was inspired by a monastery near Farneta, Italy. Noteworthy varietals include Barbera Blanc--a light blush wine perfect for picnics--and Cabernet Sauvignon. Sample them in the tasting room featuring two dramatic dueling wine walls behind two tasting bars at either end of the hall. Wines are available for purchase only at the winery. The Italian Marketplace food hall is designed after the mercato in Lucca, Italy, and the extraordinary food offerings almost overshadow the wines. Using Vicki's recipes, the kitchen staff prepares wonderful things for picnics: country pâté, torta rustica, hot-sweet mustard, focaccia bread, panini (Italian sandwiches), a triple-chocolate chunk cookie, tiramisu. More goodies include porcini mushroom tomato sauce (made with Viansa Cabernet Sauvignon) and spiced figs (made with Sonoma black mission figs and Viansa Cabernet Sauvignon using Vicki's grandmother's recipe). Some of the items are prepared with produce from the winery's own vegetable garden. On nice days, picnics can be enjoyed at a bevy of tables on a spacious patio situated atop a knoll with a panoramic view of the Sonoma and Napa valleys. The picnic area is on the Pacific Flyway and overlooks a wetlands that is a popular stopover for hundreds of bird species. On cooler days, tables are available inside. Euro Spa & Inn 1202 Pine St., 2 blks. from downtown, (707) 942-6829. 13 rooms. All gas heaters. Heated pool; hot tub; full-service spa. Afternoon cookies & cider; continental breakfast. No pets. Children welcome. Built in 1935, this motel has a center courtyard and is shaded by mature trees. Downtown is just a nice two-block walk through a pleasant tree-lined residential neighborhood. A self-serve continental breakfast is served outdoors on a sheltered patio and includes whole fresh fruit as well as a prepared fruit bowl, delicious pastries from Costeaux French Bakery in Healdsburg, and an egg entrée such as Dungeness crab-scrambled egg strudel. The spacious pool area has several large grassy areas, shade trees, and plenty of lounge chairs. A free shuttle operates within a 3-mile radius. Guest rooms vary in size, but all are roomy. Decor is simple, with wall-to-wall carpeting and a few pictures on the walls. Beds have knotty pine headboards and are made up with white cotton sheets and topped with a light white cotton-covered duvet. All rooms have a small front porch, and free wireless is provided throughout. Under separate ownership, The Spa ((707) 942-4056) is tucked into a detached part of the motel. It offers an extravaganza of treatments, including a soothing and detoxifying mud wrap using several kinds of clay, local milled grape seeds, and local volcanic ash. (This is different from the traditional mud bath available at some other places in town, where you actually climbs into a tub full of volcanic ash mud. In this case, the creamy mud feels like wax and is applied by an attendant.) Local grape seeds are also used in a foot renewal treatment, and an oxygen facial infuses effervescent oxygen and peptides into the skin for a firming treatment. More things to do in Calistoga. Madrigal Family Winery 3718 North St. Helena Hwy./Larkmead Lane, (707) 942-1065. Tasting by appt., daily 10-4. Since the late 1930s, when grandfather Jess came to the Napa Valley from Mexico, three generations of the Madrigal family have farmed the Napa Valley vineyards. Grandson Chris Madrigal studied wine making at U.C. Davis and now heads the current generation and this small winery that sells most of its production through its wine club and tasting room. If you join the wine club, tasting is complimentary and you can take part in some special tasting programs, including a pairing with food from Calistoga’s Jolie restaurant or a lunch with owner Chris. Summer Kitchen + Bake Shop 2944 College Ave./Ashby Ave., Claremont, (510) 981-0538. L-D daily; $$. No reservations. Mimicking an old-fashioned cottage with touches such as a screen door and ceiling fan, this small counter-order spot knows how to make a sandwich. A favorite is the apple-smoked bacon with avocado, piquillo pepper, arugula, and housemade mayo. The hefty fried chicken consists of a flat slice of crispy fried chicken breast, coleslaw, mustard sauce, and housemade sweet pickles. Salads include watermelon with feta and sherry vinaigrette, curried chicken, and both cauliflower and beet. Burgers and pizza are also available. Cup cakes and marble cake make a nice dessert, and Ici is just next door. Heftier dinners become available at 4 p.m.
Stevenson House Adobe and Garden 530 Houston St./E. Pearl St. Sat & 4th Sun 1-4pm. This two-story 1830s adobe was for six months the boarding house for author Robert Louis Stevenson and is now a museum of his personal belongings. Mandarin Garden CLOSED 2025 Shattuck Ave., downtown, (510) 848-4849. L T-F+Sun, D Tu-Sun; $$. Takes reservations. Divided into three good-sized dining rooms, this old-school Chinese restaurant features wall-to-wall carpeting (for serenity) and a small fish tank filled with big gold fish (for fun). The menu is divided into two cuisine styles—Mandarin and Szchuan, with a special chef for each. Specialties include a dramatic boneless Peking duck, cumin lamb (a typical Xinjiang dish), and something called Double Skin (fresh mung bean flat noodles, blanched julienne carrots, cucumber, egg crepe, calamari, shrimp, sea cucumber, onions, mushrooms, and pork tossed with soy sauce vinaigrette and hot Chinese mustard). Menu favorites include pot stickers (note that these take a long time to prepare), minced chicken lettuce wraps, General Tao’s chicken, and kung pao chicken (a diced, dry-fried, veggie-free version). Sichuan dishes include spicy peanut noodles and a brilliantly colored spicy garlic eggplant. Lunch specials are a bargain and include an entree, appetizer, soup, fruit, salad, and steamed rice. August Briggs Winery 1307 Lincoln Ave., (707) 942-4912. Hrs. vary. Named for winery founder August “Joe” Briggs, this employee-owned winery has no dedicated facility. All of the 15 wines across 7 varietals are made at another winery, where they lease space and equipment and then oversee and do everything themselves. Sampling occurs here, in this tasting room, and most of the wine is sold directly to a dedicated group of wine club members I especially enjoyed the light and refreshing 2012 Napa County Rose, the silky 2011 Carneros Chardonnay, and the 2010 Page Nord Napa Valley Syrah (the 2001 vintage was poured in the Bush White House). A nice touch is that the label is silkscreened onto the bottle in 22-karat gold.